Make the start of the weekend worth the wait with our maximum-pleasure, minimum-fuss take on steak and chips. It’s perfect for a night in when you want to cook and serve a meal to remember. Heat the oven to 220°C/200°C fan/gas 6. Put the fries in cold water and soak for 20 minutes. Drain and pat dry with kitchen paper. Put the duck fat in a large roasting tin and heat in the oven for 5 minutes until very hot but not smoking. Add the chips to the hot fat, toss to coat, then sprinkle over the polenta, season with salt and toss again. Roast for 50 minutes, turning now and then, or until golden and crisp. Meanwhile, make the pesto hollandaise (see tip). In the small bowl of a food processor (or in a pestle and mortar), whizz/pound the garlic, herbs, salt, lemon zest and juice and parmesan, then drizzle in the olive oil and whizz/pound again. Put the egg yolks and vinegar in a small glass/ceramic bowl and set over a pan of simmering water over a low heat (don’t let the base of the bowl touch the water). Using a wooden spoon, beat the egg yolks for a minute, then start adding the butter a cube at a time, beating all the time with the wooden spoon until the mixture has emulsified into a smooth sauce. Turn off the heat but leave the bowl over the pan. Just before serving, stir in the pesto. Once the chips have had 20 minutes in the oven, heat an ovenproof griddle pan (or frying pan), rub the steak on each side with a little rapeseed oil and season with salt. When the pan is smoking hot, cook for 2-3 minutes on each side until deep brown all over. Put the pan in the oven below the chips and roast for 15-20 minutes until the thermometer reads 55°C (for medium-rare). Take out of the oven and rest on a warm plate, turning once, for 5-10 minutes. 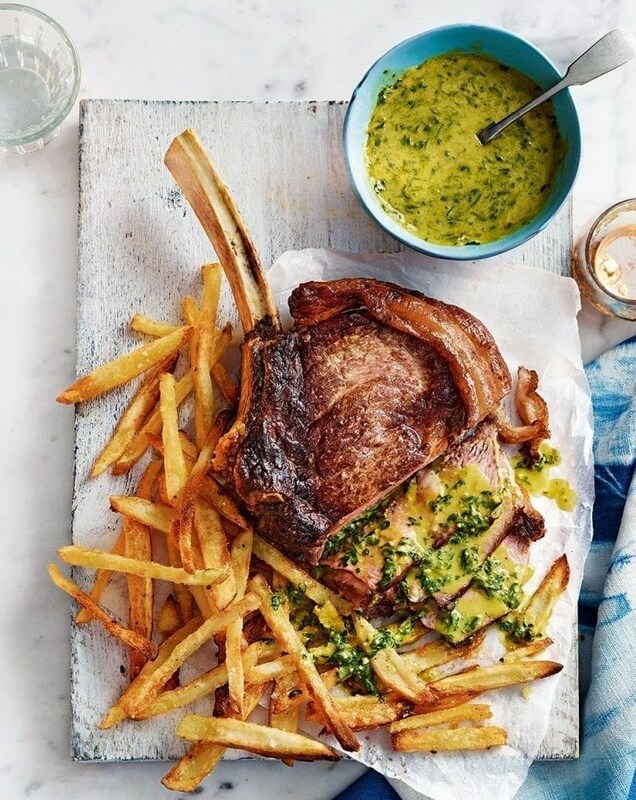 Serve on a platter with the chips and a bowl of the pesto hollandaise. Slice the steak and enjoy. You can also make hollandaise (steps 3 and 4) quickly in a food processor: make the pesto first and set aside. Rinse the processor bowl, then whizz the egg yolks and vinegar. Slowly drizzle in the melted butter with the processor running until the mixture thickens. Stir in the pesto and serve. Côte de boeuf (rib steak) is a cut from the forerib with the bone attached. The meat has good fat marbling and, as it’s cooked on the bone, lots of flavour.